Recombinant monoclonal antibody to EGFR. Manufactured using AbAb’s Recombinant Platform with variable regions (i.e. specificity) from the scFv S3 12D. Application Notes: The antibody binds specifically to EGFR, a cell-surface receptor which is part of the ErbB family of receptors. The EGFR is a receptor tyrosine kinase, which, upon activation by its ligands, such as epidermal growth factor and transforming growth factor alpha, triggers signal transduction pathways that increase cell migration, adhesion and proliferation. Mutations that lead to the overexpression of EGFR are associated with the development of cancer. 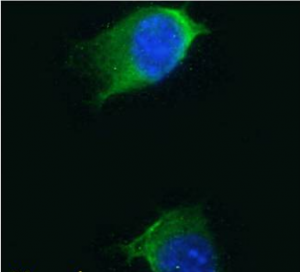 The S3 12D antibody is prepared from isolation of phage antibodies of the spleen library. Note on publication: Describes the phage-antibody technology, which is used to produce three phage-antibody libraries from which mouse anti-EGFR scFv antibodies are generated. The libraries are prepared from the spleen, lymph node and in vitro cells of an immunized mouse. The antibodies produced are compared with a mouse mAb, 425, isolated by standard hybridoma technology. Flow-cytometry on mouse splenocytes using Ab00452. 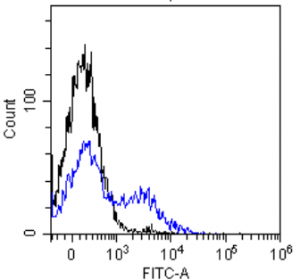 Flow-cytometry using the anti-EGFR S3 12D (Ab00452) Mouse splenocytes were stained with unimmunized rabbit IgG antibody (black line) or the rabbit-chimeric version of S3 12D (Ab00452-23.0, blue line) at a concentration of 10 µg/ml for 30 mins at RT. After washing, bound antibody was detected using anti-rabbit IgG JK (FITC-conjugate) antibody (129936) at 2 µg/ml and cells analyzed on a FACSCanto flow-cytometer. IF staining of NIH3T3 cells using Ab00452. Immunofluorescence staining of fixed NIH3T3 cells with anti-EGFR antibody S3 12D (Ab00452) Immunofluorescence analysis of unpermeabilisd paraformaldehyde fixed NIH3T3 cells on Shi-fix™ coverslips stained with the chimeric rabbit version of S3 12D (Ab00452-23.0) at 10 µg/ml for 1h followed by Alexa Fluor® 488 secondary antibody (1 µg/ml), showing membrane staining. The nuclear stain is DAPI (blue). 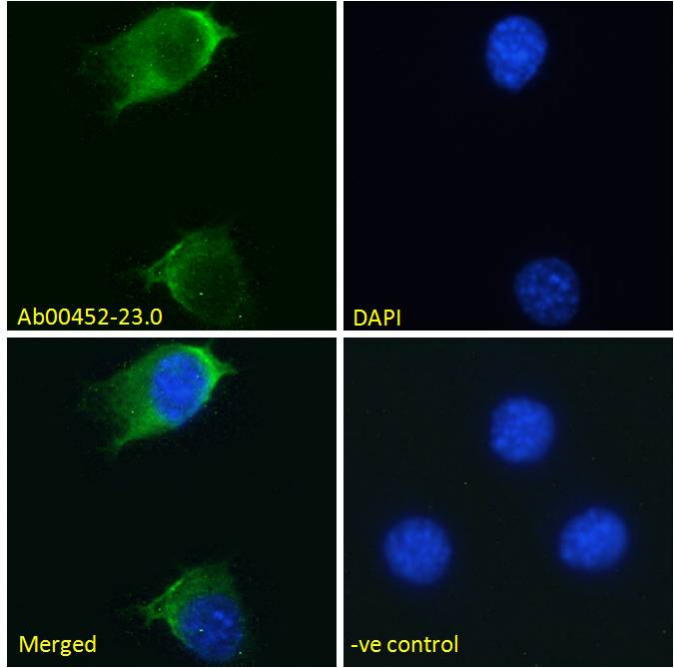 Panels show from left-right, top-bottom Ab00452-23.0, DAPI, merged channels and an isotype control. The isotype control was stained with unimmunised rabbit IgG followed by Alexa Fluor® 488 secondary antibody.